Choosy is one of those tiny pieces of software that quickly becomes indispensable. Its premise is beautifully simple: open the right link in the right browser, every time. That premise belies its incredibly power though. Choosy also lets you set behaviours and customs actions. Always open mail:to links in Chrome? No sweat. Send a link from Chrome to Safari? Easy. The accompanying extensions – for all of the major browsers – make that a piece of cake. I was introduced to Choosy by George Brocklehurst, a former colleague and Choosy's creator (when he saw me copying and pasting links between browsers). I used it for years and was dismayed when it finally stopped working because of changes in OSX. When it came time to update Choosy, I happily took George up on his offer to update the icon. The previous icon felt complicated, especially given how simple Choosy is to use. In fairness, the original icon was a product of its time and reflected Apple's Aqua aesthetic with reflections, gradients, and 3D effects. My goal for the icon’s redesign was to simplify it as much as possible. It needed to feel elegant, simple, and straightforward. After some thought, I chose to base the new version on one of the original icon’s triangles. This creates a tie between the original icon and the new one. It's a strong geometric element and communicates the concepts of direction, navigation and movement. Finding the proper balance of the C to the triangle proved to be a surprising challenge (turns out that mathematical alignment was completely visually wrong). 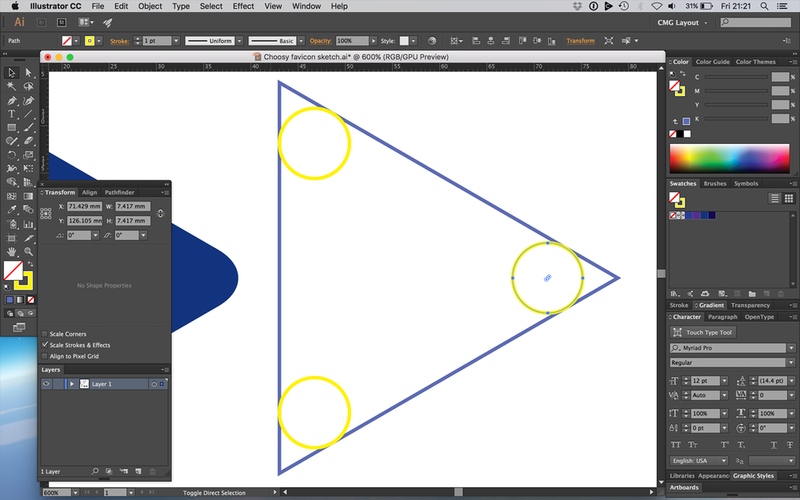 I also found drawing a geometrically perfect triangle with rounded corners very, very difficult (I was trying to use the Pathfinder tool to merge circles with the corners of a triangle and then remove the negative spaces). In the end, I’m very happy with how the final version turned out. A particularly difficult challenge was ensuring that the icon represented well at all sizes – as small as 16 pixels square, for use in the Apple menu bar and as a favicon (the 16 pixel square version actually has a slightly different layout and font weight to render properly). The final icon. From left to right at 1024 x 1024, 512 x 512, 256 x 256, 128 x 128, 64 x 64 and the tiny 16 x 16! You can buy Choosy for $10 USD. It’s worth every penny.